Disclaimer: The following article is solely the opinion of the author and is not based on insider or non-public information. The author is not privileged to insider information and there is no disclosure of information that is not readily available to investors within this article. Yesterday it was announced that Paychex (NASDAQ:PAYX) will be purchasing Oasis Outsourcing for $1.2B dollars. The full announcement may be viewed here. Oasis Outsourcing was by far, the largest privately held PEO in the United States servicing over 8,400 SMBs. Oasis was backed via private equity investors, most notably, Stone Point Capital. The PEO industry, which is already very top heavy in revenue distribution, will become even more top heavy through this acquisition. As noted in our most recent industry statistics synopsis, while the market is heavily fragmented, the revenue distribution is not. It is estimated that the top 15 players produce three quarters of the industry revenue. If there are roughly 750 PEOs in operation today within the United States, this means that 75% of the industry revenues are driven by the top 2% of PEOs. Granted, the majority of PEOs are privately held, and therefore these numbers are best estimates. What Does the Future Hold for Paychex & Oasis? In this author’s opinion, the future looks bright for the combined entity. Paychex has a very wide client base of payroll and PEO customers. Oasis, is a well-run PEO with excellent leadership, a strong value proposition, and solid infrastructure. The synergies that likely exist between the two entities are exciting. Especially if you look to history and competition as an indicator. 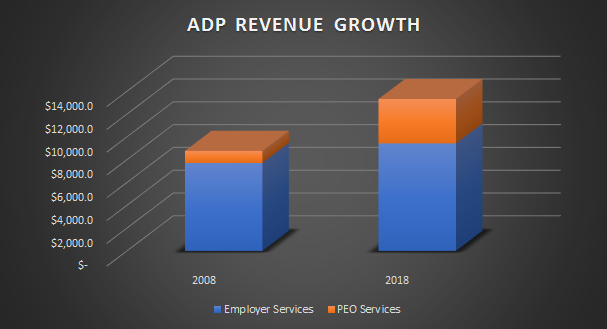 As you will note below in figure 1 and figure 2, PEO services contributed substantially to ADP’s growth in the last ten years. Moreover, ADP’s stock price as of 11/07/2008 was at $35.43. As of 11/27/2018, ADP is trading at $144.62. This represents an increase of roughly 308%. Granted, there are other factors that play into a stock’s price. However, with revenue increasing more than 50% in the last ten years for ADP coupled with the PEO segment expansion, it is easy to see the benefits of combining a large payroll client base with a solid PEO infrastructure. Paychex annual revenues (in millions) for fiscal year 2018 were $3,380.9. [ii] Add to this, the largest privately held PEO in the United States, and the company is positioned for excellent economies of scale. Oasis which services approximately 8,400 clients[iii] appears to have a strong infrastructure as does Paychex. They both operate on Prism HR technology for their PEO business according to PrismHR’s post below. Operating from the same tech platform should help assimilation efforts if they plan to merge any part of the operations in the future. 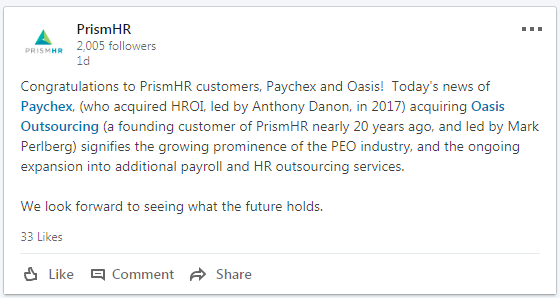 PrismHR LinkedIn post referencing the Paychex/Oasis transaction. Moreover, Paychex now possesses greater scale for insurance procurement across multiple lines. In addition, the features and benefits of each entity will now be available to a combined sales force to take to market and potentially cross-sell the existing client base. Combined, both Paychex and Oasis appear to be stronger together than separate. If the two entities avoid any major assimilation issues post transaction, I anticipate strong growth at Paychex in the coming years. I have spoken in depth with many CEOs within the PEO industry over the last five years. I was impressed with Mark Perlberg and he was one of those at the top of my personal list for quality CEOs within the industry. While I don’t personally know the CEO of Paychex, Martin Mucci, he has a high approval rating on Glassdoor and Paychex revenues have grown nearly 64% during his tenure as CEO. A lot can happen with an acquisition of this size, but if done correctly, I think the combined entity of Paychex and Oasis will be a force to be reckoned with over the next decade. From a stock perspective, I personally would play PAYX long. While I believe that as a country we have a market correction coming, I believe PAYX will be a smart investment for patient investors. Even with a potentially looming bear-market, the PEO industry has historically rebounded quickly in down economic times. For further insight into industry performance, see our article titled Are Professional Employer Organizations a Sound Financial Investment? Finally, I have noted via LinkedIn commentary that some within the industry aren’t sure if they like the Paychex/Oasis deal. I personally believe that it is a very favorable deal for both Paychex and Oasis and ultimately will benefit the industry. However, I understand that the deal may not be viewed as favorably by smaller PEOs. These mixed reviews may be due to the fact that the majority of players within the PEO industry aren’t behemoths. In light of this acquisition, for those PEOs whom aren’t as large as the top revenue players within the industry, please review our article titled How Does a Smaller PEO Compete in Today’s Market? for ideas and insight on competing within a consolidating top heavy industry. 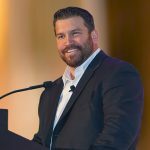 Author: Rob Comeau is the CEO of Business Resource Center, Inc. www.biz-rc.com, a business consulting and M&A advisory firm to the PEO industry.